After six rounds of the Frank Berry U.S. Women's Championship (July 16-20, Stillwater, OK), Katerina Rohonoyan and Irina Krush are tied for first with 4.5/6. In round five, Krush defeated yesterday's leader, "Baagi", while Katerina pulled an upset against defending champion Anna Zatonskih. The two leaders face-off tonight at 6 PM EST. Watch the games live on monroi.com or on the official website! In round five, all games were decisive. The two most relevant to the standings were Irina's victory over "Baagi" and Katerina's attacking victory over Anna Zatonskih. Batchimeg Tuvshintugs, "Chimi" and Irina Krush both won back to back games yesterday. Photos Betsy Dynako. Katerina Rohonyan and Tsagaan Battsetseg are both having excellent tournaments so far. Photo Betsy Dynako. Not to be outdone by her former compatriot Tsagaan Battsetseg, Mongolian-American Batchimeg Tuvshintugs is also creeping up the charts with two wins yesterday, against Camilla Baginskaite and Elizabeth Vicary. 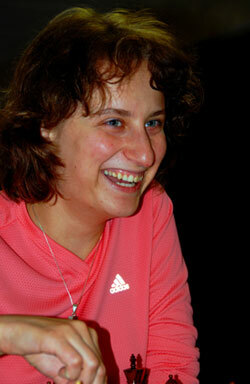 Camila Baginskaite won against Alisa Melekhina in round six, while Anna Zatonskih drew with Tatev Abrahamyan. Mikhail Tal watches over. Photo Betsy Dynako.